An under construction building collapsed in Missal Gadi area of Uttar Pradesh's Ghaziabad district on Sunday. As per reports, 2 people died and 9 got injured in the accident. The district police, fire department and NDRF teams have been rushed to the spot and the rescue operation is underway. Two people died and nine got injured on Sunday after an under-construction 5-storey building collapsed near Missal Gadi in Ghaziabad district of Uttar Pradesh. The building was located in the Akash Nagar area of Masuri police station limits. The district police, fire department and National Disaster Relief Force teams have been rushed to the spot and the rescue operation is underway. 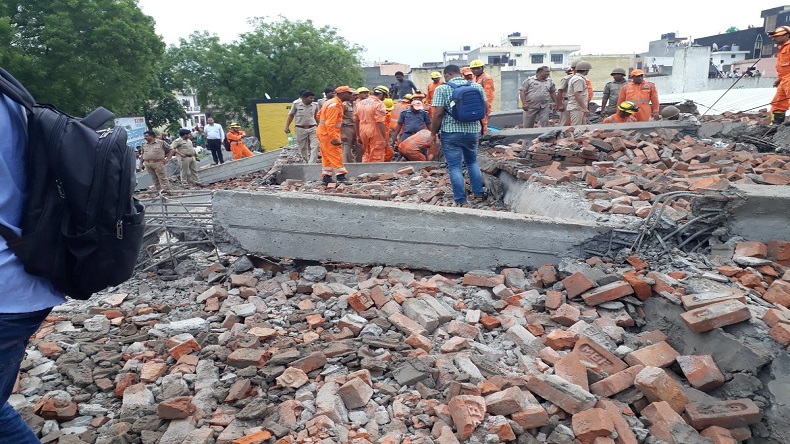 According to ANI, NDRF team has rescued a person from the site of a five-storey building collapsed in Ghaziabad’s Missal Gadi. Reports added that one body has also been recovered by the NDRF team. However, few people are still feared trapped within the debris. “A crack appeared in the column of the building this morning, but the builder told us to fill the cracks with cement and forced us to continue. We were working on the upper floor, the column must have collapsed on the ground floor,” news agency ANI quoted labourers working at the building collapsed in Ghaziabad as saying. A few days back, 2 adjacent buildings were collapsed in Greater Noida of Uttar Pradesh, which resulted took away the 9 lives. After an initial investigation into the matter, local police arrested the landowner of the building. The Ghaziabad building collapse is the third such incident in the same week. Uttar Pradesh Chief Minister Yogi Adityanath has directed District Magistrate and SSP Ghaziabad to visit the site of the building collapse in Ghaziabad. He further asked the district officials to take immediate action for rescue operations along with NDRF and lodge an FIR and take action against those guilty. Speaking on the matter, Ghaziabad DM Ritu Maheshwari informed the media persons that a magisterial inquiry has been ordered into the matter. She added that 7 people have been rescued and sent to hospital so far.